I decided to go down there and see if I could find any. First up, the good news: I didn’t. And now the bad news: it became all too clear from the get-go someone has a pretty brisk business selling and/or consuming illegal intoxicants— especially around Nassau Avenue and Russell Street. Without further ado here is a slide show featuring the rainbow assortment of baggies I found on my sojourns. I have tossed in a few shots of dead squirrels I found as well. Why, you ask? 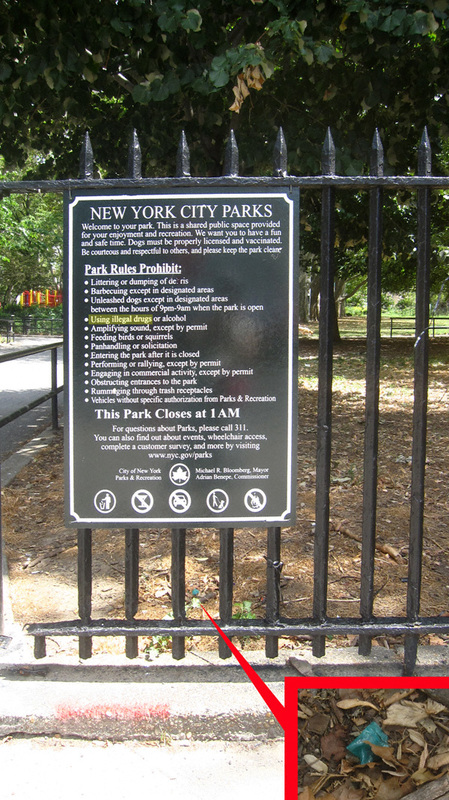 Because one would think the Parks Department would be “on” that kind of thing. Enjoy! I live on McGolrick Park and have seen more drug activity lately- came home from work one day to a woman nodding out in her car parked in front of my apt.- car door was wide open and she was seriously messed up. I called the cops and they were uninterested. I asked them to come because I figured if she tried to drive in her condition it would be dangerous. They asked if I had “seen her commit a crime” and I said no, but obviously they might want to check into the situation and they refused. What’s even more disturbing than the amount of bags, is the amount of different color bags. Different dealers use different color bags because they get their supplies from different places. Bottom line is, this means there are many dealers working the area. No kidding. That was a veritable rainbow of baggies. So it goes in our “war” against drugs. And the plethora of dead squirrels could mean another outbreak of Leptospirosis is in the works. As I recall, there were a few cases of it around McGolrick back in 2004/ 2005. The 2 dogs I know who died from it did not use the run. Just walked the park. Info about how it is transmitted here: http://www.labbies.com/lepto.htm This disease can be transmitted to humans…it is rare for that to happen, but be careful everyone.